My love for animation gave me the drive to move from Iran to the United States in 2004 to pursue a career in bringing characters to life. It was through Animation Mentor that I studied the different aspects of character animation. Now, with the tutelage of some of the greatest and most talented animators in the industry, I get to entertain audiences by putting little expressions we take for granted on the pixels that I bring to life -- the quirk we do when we scratch our faces in uncertainty or the perplexed frown we give off when we are upset. The journey was long and full of twists and turns. I started from an early age of 10 doing what most kids do, drawing on every piece of paper, doing flip books, and drawing on the edge of books and note books. I drew and drew, and drew unaware yet of my passion and where it could lead me. I studied Computer in Iran and was on the path to a career my heart didn't want to follow. There was this burning inside, lurking deep within me, wanting to burst out. My buried creative side wanted to show the world the beautiful things I can imagine. I thought on it for months and decided just making a living wasn't good enough. A career is one life's work, and I didn't want my life to be represented by something I didn't love to do. 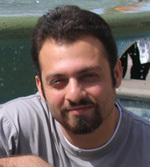 It was in my 20's that I decided to leave Iran and study abroad. I left, eager to take on my passion, and studied animation in India for a year. The opportunity to learn animation in India was extremely useful and something I will always be grateful for. I worked very hard there but knew that if I wanted to be at the forefront of animation I had to be where the best animators were. I decided to move to the United States where I made up my mind and enrolled in Animation Mentor and never looked back. I've been animating CG characters ever since and have been loving every aspect of this profession. The passion that drove me here and the belief, that overcame self-doubt, negativity, and adversity is still my driving force today. If there's something out there that you want, believe in yourself and don't give up until you get there. Work hard and stay true to your heart. And of course keep animating!